In Australia in 2012 we are having a year long celebration of reading: the National Year of Reading 2012. One of the first activities is to get readers' views on what are the books that reflect what our sense of place and identity. So there is the Our Story competition going on across all states and territories to identify the one book people identify with most in their place. Shortlists have been compiled and circulated and the closing date is 6 January 2012. You can vote at your local public library, bookshop or online at the ABC website. You can get more information about the Our Story competition and the shortlisted books for all states and territories on the National Year of Reading site. 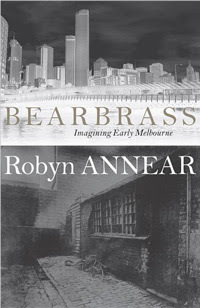 Among the six books shortlisted for Victoria is Robyn Annear's Bearbrass which was first published in 1995. It was awarded the A.A. Phillips prize for Australian Studies in the 1995 Victorian Premier's Literary Awards, and was shortlisted for the 1995 NSW Premier's Literary Awards and the Age Book of the Year. Bearbrass was republished in a new edition in 2005. Based on one of the early local names for Melbourne, Bearbrass reconstructs the early village as it might from been from 1835 when white settlers first appeared until the village was changed forever by the gold rushes of the 1850s and the resultant population influx. Annear overlays the nineteenth century village with her impressions and experiences of the modern city making an entertaining read that touches the reader on many levels. Will you be voting for Bearbrass in the Our story competition?